Stay tuned for upcoming events for FAST Music Fest in near future. FAST Music FestFace The Music! FAST Music Fest 2018 will be held on 26th to 28th January 2018 at FAST- NUCES, Lahore. It is the 2nd edition of the annual FAST Music Fest by the FAST Music Society. FAST Music Fest '18 is going to be an eagerly anticipated 3 day fiesta of music. In addition, there will be performances from the host, FAST Music Society. It will also present fun-filled socials and activities for the participants, celebrity guest judges and appearances. A grand concert on the last day will conclude the extravaganza event. So gear up, and mark your calendars for the exciting event of the winters here at FAST NU. 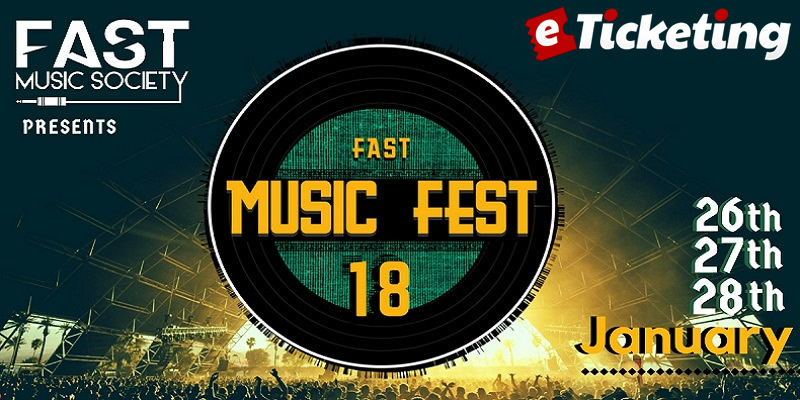 FAST Music Fest is a musical mega event that takes place every year as a competition that caters to the musical talent from all the reputable contemporary educational institutions. It is a platform for amazing musical performances from artists, singers, instrumentalists, and bands and a whole weekend of non-stop, exhilarating musical goodness. It is a multi day event and every day is focused on a genre based theme. People of FAST are presented with unlimited musical entertainment during FAST Music Festival, and are encouraged to Face The Music. FAST Music Society is the official music society of FAST NU. Its aim is to promote and enhance the musical talent in the Lahore campus of FAST NUCES. It organizes and participate in musical events on and off campus. Terms & Conditions : FAST Music Society reserves the right of admission to the venue and event. Best Viewed at 1024 x 768 pixels and above. This Page loaded in 0.0232 seconds on Tue, Apr 23, 2019 (21:02).